Hair is a slender, thread-like outgrowth from a follicle in the skin of mammals and is composed primarily of proteins (88%) of a hard fibrous type known as Keratin. Keratin protein is comprised of what we call “polypeptide chains”. Many (poly) amino acids joined together form a “polypeptide chain”. The “alpha helix” is the descriptive term given to the polypeptide chain that forms the keratin protein found in human hair. The amino acids link together to form the coil and there are approximately 3.6 amino acids per turn of the helix (coil). Two amino acids are joined together by a “peptide bond” and the correct number of amino acids placed in their correct order will form a specific protein i.e keratin, insulin, collagen and so on. The peptide bond is located between the carbon atom of one amino acid extending to bond with the nitrogen atom of the next amino acid. In the structure of a single hair, three “alpha helices” are twisted together to form a “protofibril”. This is actually the first fibril structure of the hair. Nine protofibrils are then bundled in a circle around two or more to form an eleven-stranded cable known as the “microfibril”. These microfibrils are embedded in an amphorous unorganized protein matrix of high sulphur content and hundreds of such microfibrils are cemented into an irregular fibrous bundle called a “macrofibril”. These macrofibrils are grouped together to form the cortex (or the main body) layers of the hair fibre. Packed dead cells surround these structures and are known as the cuticular layers of the hair. In the center of these structures lies the medullary canal, which is actually a part of the excretory system and houses any foreign debris, heavy metals, synthetics and medications that are thrown off by the body and eventually released through the canal. The original configuration of the hair is held in place by the bonding found in the cortex layers of the hair. 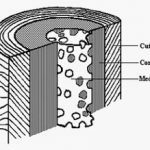 A strand of hair has three layers: the cuticle (outer layer), the cortex (middle layer) and the medulla (inner layer). A hair grows from the dermal papilla and with the exception of that point of generation, is made up of dead, cornified cells. It consists of a shaft that projects above the skin and a root that is embedded in the skin. The lower end of the root expands to form the root bulb. Its basic components are keratin (a protein), melanin (a pigment) and trace quantities of metallic elements. These elements are deposited in the hair during its growth and/or absorbed by the hair from an external environment. The dermal papilla is fed by the bloodstream which carries nourishment to produce new hair. The dermal papilla is a structure very important for hair growth because it contains receptors for male hormones and androgens. Androgens regulate hair growth and in scalp hair, Androgens may cause the hair follicle to get progressively smaller and the hair to become finer in individuals who are genetically predisposed to this type of hair loss. 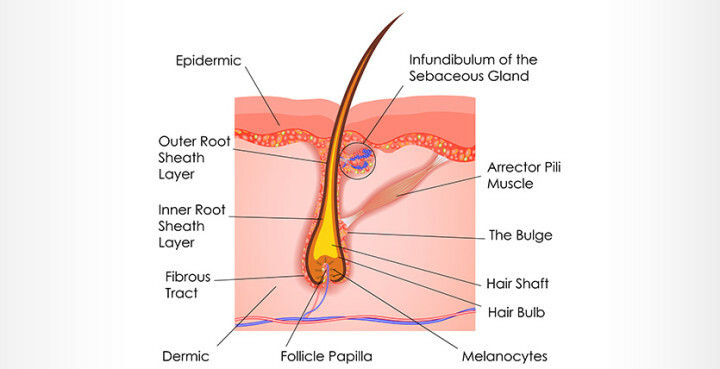 After a period of growth, the hair remains in the follicle in a resting stage to eventually be sloughed from the body. The medulla is a honeycomb keratin structure with air spaces within it. The cortex gives flexibility and tensile strength to hair and contains melanin (giving hair its colour). Without melanin, the partly hollow hair appears grey. The cuticle is made from 6 to 11 layers of overlapping semi-transparent scales (which make the hair waterproof and allow it to be stretched). Thick, coarse hair contain more overlapping layers of cuticles than fine hair. Hair structure is such that a healthy hair shaft will be very strong: it can stretch upto 30% of its length, absorb its own weight in water and swell up to 20% of its diameter.